Are Mel B & Husband Stephen Belafonte Ready To Call It QUITS?! 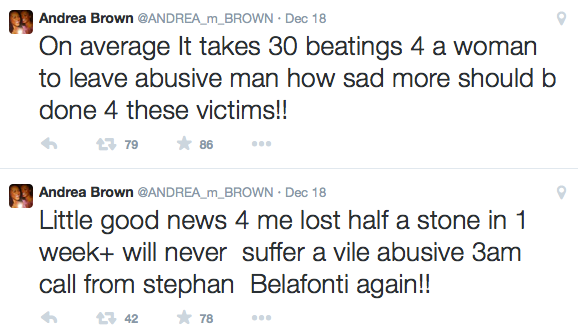 + Mel B’s Mom BLASTS Stephen For Being…Abusive? Rumors are circulating that Mel B and her husband Stephen Belafonte may have called it quits. And to add fuel to the fire, Mel B’s mother blasted Stephen on Twitter for being abusive, following Stephen’s denial that he abuses his wife. Deets inside…. This time of year couples are usually spending more time together and make holiday memories. But for one couple, it seems things are falling apart. Rumors are circulating that former Spice Girl and “X Factor” judge Mel B and her husband Stephen Belafonte may be calling it quits soon. It’s reported she postponed her eye surgery procedure (she recently revealed she has been blind in one eye) as she tries to sort out a possible divorce from her film producer husband. Last week, fans grew concerned over Mel B’s appearance on the “X Factor”, once she appeared on the show after missing the first live show on Dec. 13th. Following a hospital stay, the 39-year-old singer returned to the show on Dec. 14th and she had bruises on her face, a bruise on her cheek and scratches on her arms. A source close to the "X Factor" show revealed Stephen didn't even come to visit her during her three-day hospital stint. "Mel hasn't spoken to Stephen once since her admission to hospital last week and as it stands she doesn't want to see him. He didn't come to the hospital at all. The fact that he left the country before she'd even gone back on X Factor is another sign of just how bad things have become between them."